I have been continuously learning for the last 39 and 3/4 years, a teacher of my own children for the last 12 years, and I have been a professional teacher for the last 6 years. Sounds pretty impressive when you think about it that way and yet I would consider myself far from being an expert. 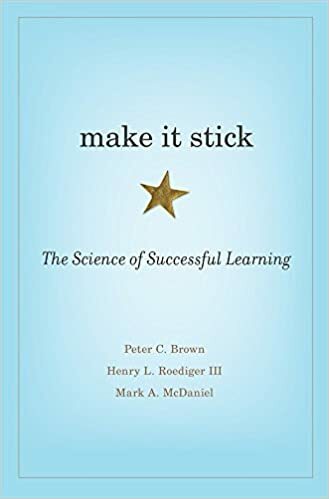 In fact, I am still scratching the surface of teaching & learning, so recently I joined a book club at work that was focusing on the book Make it Stick, which was looking at strategies to help learners learn. The book was a fairly easy read, and in my opinion, lacked any real empirical research and spent a lot of time looking at a few specific incidents rather than large case studies. What I did get out of the book was a sense of testing skills and knowledge in a non-stressful but informative way, and that learners "make it stick" when they have an emotive connection to what they are learning. These two things I guess underpin my thoughts about developing my own practice, and I have tried this year to create a calm classroom where we students can come in and feel relaxed but know that they are going to learn topics to a high level. I don't believe for 1 second that this has been 100% successful but I do know that for some classes and in particular some students feel that my classroom is a sanctuary away from all the exam pressure that is around them. I do really worry about what pressures our children are under at school. I am not really talking about from their peers, although this would be a post in itself, but from the system of having to be successful and that success is measured from the grades or "progress" that students back from year 6 to year 11. I have been really worried about a number of my students this year that have struggled with mental illness and anxiety and the root causes of this are far from obvious and I am not pointing the proverbial finger at any individual part of education and growing up, but really there is a need to look at what happens to our children during the first 16-18 years of their lives. It isn't just the students that are suffering in our education system either. Teachers are struggling with the amount of work that they are doing and the hours a week that they put into their roles. Last year in our school we were surveyed about the number of hours a week we work and it was something of an eye-opener. I spent the best part of 70 hours a week on work and sadly the least of that was on planning lessons! I have been really lucky this year and have visited a couple of schools in other countries and looked at what the education system looks like for them and also talk to students about their interactions with education and how different things are especially as they are really engaged because they have a vision of what they will become in the future. I'm not sure our students have that vision and desire which comes back to my idea of the need for an emotional connection with whatever it is that they are learning. This for me rings true from the book with the desires of the case studies to become doctors or pilots etc and with my own learning too. The desire to succeed overcomes the barriers put up when we fail and the instead of seeing a failure we see a chance to rebuild and be successful. My wife and I took dance lessons together for a number of years after our first son was born as a way of getting some me time together once a week and it was amazing. I was emotionally connected to the dancing because I was doing something fun but also doing it with my wife too and we would practice in the kitchen and anywhere we could find a space big enough to do it. This was highly successful learning as we had to stop a couple of years ago due to our every growing family but we still have some of our dance moves in our heads despite not practising them for years. I wanted to write to you all to let you know how proud of you all I am. I have taught some of you for just this last year and others for a few more years and I wanted to take this opportunity to tell you all how very proud of you I am. I know that it hasn't been easy taking on the new GCSE and the new grading system. I know that at times you sit in my lessons listening to me drone on about something abstract that I have been trying to teach you and I may have been talking double dutch as you haven't picked up on something that I said but I want you to know that all year I have been teaching you not only to be good at maths but skills in order to tackle problems that you may face in later life. I have tried to make my classroom as friendly and relaxing as possible as I know this year you have been hearing lots of messages about working harder and planning revision sessions but I hope that you heard my message about spacing revision with time to switch off, relax and let your mind and body rest as I believe that you need to give yourself a chance to demonstrate how amazing you are. I also want you to remember that life is more than your exams will ever assess you for. There is no test for friendship, loyalty or honesty. Your exams will be over in a couple of weeks and then you can enjoy your long holiday before whichever sixth form you have chosen to go to. Life throws situations at you which you either tackle by yourself or get some advice from friends and family to help you along your path and I hope that we have helped you to develop these skills during the last few years at school. At the start of this year, I took on the biggest group of year 11 students I have ever had. I have seen you all develop over the last year and I know some of you have really struggled with the pressures this year and I hope that I have helped you to manage the exam stresses so that you are as comfortable as possible in the run-up to exams. Good luck with your exams, I wish you all every success in them and in the future and I am so very proud of you all. This year I have been thinking about people that have inspired me and it has made me think about firstly who has inspired me and what was it that they did that makes me hold them in such high regard. So my list is people that I have had direct contact with rather than famous people that have been brilliant in their own field so a real personal list for me. The list I have come up with shows the different forms inspiration can take and that you don't need to be famous or be in a position of power to influence the lives of others around you. So I guess going back to when I was a child and thinking about my Maths teacher Theresa Chapman. In most people's eyes, she was just a secondary Maths teacher at an independent school that taught me GCSE and half of my A-level maths. At the time of being at school I guess it wasn't anything specific that she did but when I saw her a few years ago at a school reunion, she was just retiring, and she immediately knew that I had become a Maths teacher and she always knew I would. Reflecting on this conversation that I had with her and the method I took to get where I am today she knew and had faith in me far beyond the faith I had in myself. To me, this is an inspiring quality that I hope my students get from me. I have faith and belief in them and I hope that they aren't just thinking that I am just pushing them to achieve a better grade. I have really tried this year to give them a space to learn but also feel comfortable and I know that a few of them have really been feeling under pressure and are suffering from anxiety from all of the exams that they are about to take. So moving through to more recent times the next person that I remember feeling inspired by was a former CEO of Barclays. Not the most obvious of choices I know but when I went to one the corporate events and he stood up and spoke it felt like the whole audience was hanging on everything he said. Roger Davies, was a former tank commander in the Army before being in charge of one of Britain's largest banks and I guess he was one of the last figureheads that stood out as in banking that hadn't come through finance but had been appointed as a great leader. Shortly after listening to him and chatting with him about his tours in the bar he was moved on and replaced by 'a suit'. This became someone that was driving the business rather than a leader of people. Strangely I knew which one I prefered working for. people managed to save not only my wife but also our world. The two consultants that we saw afterwards were the most amazing people that gave us so much care and attention and the community midwives that came and looked after us for months and months deserve far more than can ever be repaid. Sarah, who is a community midwife and now our friend, helped us get through an enormous barrier to venture back for our fourth visit and our beautiful daughter Hattie was born. Easter this year I went on a trip to Kenya as part of my school's charity trip that we run each year. This year I am leading the trip and went out to have a look at the schools that we were going to build at this year and also some of the other parts of the town that we can take our students to visit. This was where I met a lovely and selfless person Jedidah. She runs a baby rescue centre and orphanage in Kitale. She has been running this for the last 5 years and whilst she is only in her 30s she feels that this is what she has always wanted to do and that she hasn't made any sacrifices to follow her dream. She looks after 22 children in the home and another 20 in the community. She works really hard to get the children back into their own family or into a foster family and provides them with not only a safe home, education but also inspires them to dream about their future. I asked some of the children in the home what are their hopes and dreams for the future and they replied by saying they wanted to be an air hostess, doctor or a surveyor. They knew that they had to work hard in school to go to college and university and that they were determined to get there. I'm not sure the 12-year-olds in my class have such a clear vision! This is a diverse list and has made me reflect on what it means to inspire someone and that these people have made an impact on my life and I hope that it has not only moulded me to be a better person but also that some of the things I do have helped to inspire others.